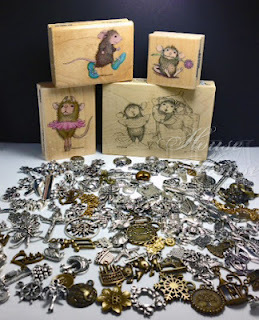 Hello crafty friends and welcome back to my little corner of blog-land. Hope you are staying cool in the heat of this HOT SUMMER. :) Sorry it's been a while since my last posting here, but my family and I were away on a mini-vaca traveling. Sure hope you played along on our 1,000+ follower celebration challenge. If you missed it, no worries, as there is always another chance for you to win great prizes with every new House-Mouse challenge. Simply visit us at HM&F MC, found here. Hope you will come join us this week for the "Lets Get Fruity" themed challenge # HMFMC123. which belongs to Hermine, of Hermi's Kreativstuberl! Congratulations Hermine!! So glad you played along! Please contact me within 3 days of this announcement to claim your fab Prize. Be sure to stop by to check out our House-Mouse & Friends MC Blog. The Design Team's Creations posted with today's midway reminder are awesome!!! 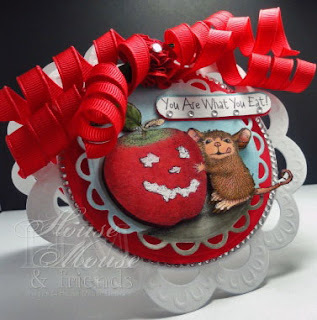 The House-Mouse & Friends Monday Challenge Blog can be Found HERE. Great card America! So colorful! This card is just adorable. A lot of love and effort went into this one, that's for sure. Congrats to Hermine. Awesome card America, beautiful shape and love the ribbon.